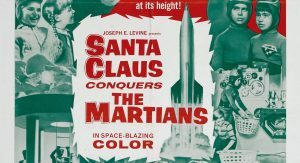 If a name like ‘Santa Claus Conquers the Martians’ doesn’t ring off “worst movie ever” warning bells in your head, I don’t know what will. This is pure schlock, start to finish. The plot? Well, the kids on Mars are raised in such a way as they reach the intellectual level of an adult when they are physically children. The current crop of kids are obsessed with ‘Earth television’, and the concept of Christmas. The solution to this? Well, some sneaky Martian adults kidnap Santa, and for no apparent reason, some kids from Earth, and take them all to Mars so the Martians can enjoy Christmas. Don’t let the title fool you. At no point does Santa actually conquer any Martians. I’m guessing the title refers to his bringing good will to Mars. What a let down. I was hoping for some sort of war-mongering, bad-to-the-bone Santa that handed out whoop-arse instead of toys. I guess I’ll have to make my own movie like that, but for now I still have this.